Running sprinklers on the right, impending downpours on the left – color me confused. Why would growers, who are much more knowledgeable about their crops, put down water when thunderstorms are rumbling on the horizon? One of the things I love most about my work is making periodic treks into the field – more often than not actual fields – to better understand the irrigation problems growers are facing. Well, we all have grand ideas that often begin in climate-controlled rooms with warm (sometimes even good) coffee as seemingly perfect ag solutions come together in a flurry of ideas on a whiteboard, followed by copious design documents. Diverse teams of agronomic professionals, scientists, engineers, and business professionals gather to identify the one idea that will make a grower’s life easier. It’s the thing movies are made of about revolutionary technologies taking some sector of the economy by storm. Unfortunately, once the field is encountered, not only do these products not solve the grower’s problem, they may have created new ones. Maybe the irrigation system constraints were not taken into account, such as pumping capacity, for a specific region. Or, maybe there was an assumption that a certain amount of labor in using our product is acceptable when in reality it’s a non-starter for the grower. Worse still, perhaps the proposed solution is for a problem the grower isn’t even facing – it’s just something that came up in a brilliant whiteboard session. Either way, a digital ag product is doomed from the start if it doesn’t find its beginnings in the midst of the gravel roads, wind turbines, and center pivots that dot the rural landscape. If it has first contact with the field in a “finished” form, it’s likely trash-bin material. Instead, the product should start on sheets of notebook paper and open dialogue with those who are struggling to make the yield happen. So, yes, a digital ag product can provide outstanding results, but only when it’s crafted with context that comes from getting face to face with those who are solving problems every day in their fields, with or without a digital tool. So, back to trekking across the country. Running sprinklers on the right, impending downpours on the left – color me confused. Why would growers, who are much more knowledgeable about their crops, put down water when thunderstorms are rumbling on the horizon? Are the soil moisture conditions so bad in this area that the impending rainfall needs to be augmented by additional watering? Do they not trust the forecast despite dark clouds and high chances of rain on the horizon? There must be more to this. For reference, the y-axis represents root zone soil moisture depletion, as estimated by our model. A value of 0% depletion represents field capacity and values of 100% depletion represent the wilting point. The blue line is the actual root zone soil moisture depletion on a daily basis. The orange “Max Soil Depletion” line represents the point at which plants are going to become stressed, based on the soil conditions and crop growth stage. 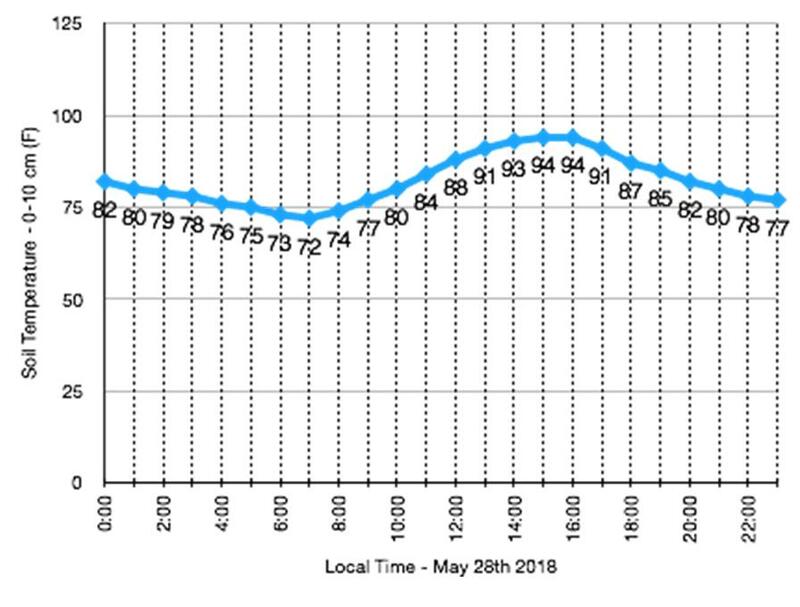 You can see that though the field is approaching stress as evidenced by it coming close to the “Max Soil Depletion” level on May 27th, it is still well above the critical value of 46%. Additionally, significant rainfall events (water drop icons in the future) are forecast that meshes with the dark skies I saw to the west on the 28th. These forecast rainfall events are expected to create a full soil moisture profile very soon, as evidenced by the depletion line rising to and hovering around field capacity through May 31st. No crop water issues here! What about the possibility of a faulty forecast? Most sources of weather information on this day were hinting at a high probability of measurable rainfall in the region on May 28th. If a grower was to look at any public weather forecasting offering it would have been clear that rain chances were fairly high across the region. Growers in that region follow a practice of keeping emerging plants “cool” and will water under hot conditions regardless of the rainfall forecast because that will mitigate the risk of crop loss. Growers were dependent on irrigation tools that did not consider the effect of forecast rainfall on the water budget for their plants. 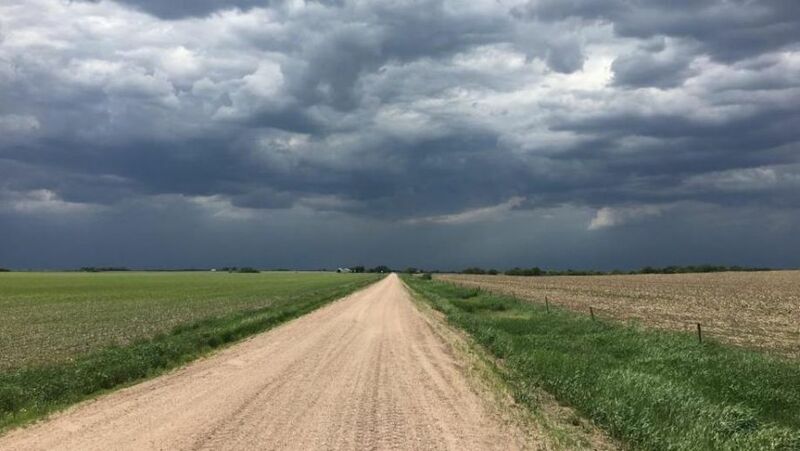 Growers had irrigation tools which indicated that forecast rainfall was to occur, but felt it was too high risk to trust the forecast and went with the safe bet of watering despite what the tool said. Are any of these thoughts the driver behind what actually occurred on those fields? Honestly, I have no idea. I just know there are tools that exist to ensure watering is done only when it really needs to occur based on physical data within the field, married with advanced forecasting techniques. The irrigation management practices that I observed may have had sound rationale behind them, but it’s a good example of the need to make irrigation decisions based on all data points available to the grower. Why? Well, unnecessary watering can lead to higher energy costs, depleted water reserves, anaerobic root environments, nutrient leaching, and disease pressures. Tools exist to minimize these negative effects and hit the mark on optimal irrigation and subsequent higher yields. Why not take the informed approach? ‘Till next time from the road, happy watering!